"Live at Play" (2009) CD/DVD; self-edition. "Were" (2012) CD; Youkali Music. 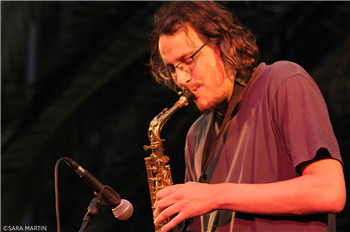 The Spaniard Pablo Hernández on alto sax has played with many different jazz, rock, funk, rai, and Arab music bands: Jorge Pardo, Javier Paxariño, Charbel Rouhana, Nass Marrakech, Wast el Balad etc. 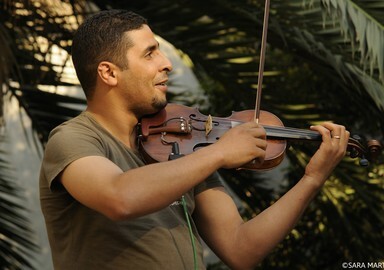 Larbi Sassi, on the violin, is regarded as one of the best performers of Arab music in the whole Maghreb, and he played in his country Tunisia and abroad, with the best bands and singers of this music. The rhythm section is leaded by the drums of the Nigerian, Akin Onasanya. He is one of the most demanded drummers in Madrid to play jazz, funk, r&b or African music and lead the afrobeat project Ogun Afrobeat. Sergio Salvi, on the keyboards and computer programming, gives the band the balance between the rhythm and the front section, thanks to his smart use of electronics and acoustics sounds. Sinouj plays originals compositions written mostly by Pablo Hernández. Sometimes they can play songs from the Arab, Turkish or Spanish traditions, but always looking for a new approach, and searching new ways to communicate these different traditions from a contemporary jazz point of view. This searching and open minded vision of the music make possible to a great range of great musicians playing with Sinouj: Jorge Pardo, Fabrizio Cassol. Sylvain Cathalà, Adedeji Adetayo, Zoumana Dembelé, Nantha Kumar or el Guadiana. This approach also make them easier to reach the audiences everywhere, and Sinouj has so far played in jazz and world music festivals in Cuba, Tunisia, Algeria, France, Portugal, Belgium and Spain.